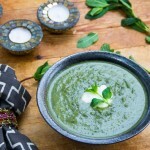 Hearty spinach and rice soup with fresh mint and tangy yogurt. 2 pounds fresh spinach, washed, stemmed and coarsely chopped or 20 ounces frozen spinach, thawed and squeezed dry. Cook The Soup: Heat oil in a large heavy pot or dutch oven over medium-low heat. Cook onion and garlic until softened, about 8 minutes (don’t let them brown). Add spinach in batches, stirring and wilting the first batch to make room for the rest. If using frozen spinach, simply add it and proceed. When all the the spinach is wilted, about 5 minutes, add 7 cups of broth, rice, salt and pepper. Bring to a boil. Quickly lower to a simmer and cook, covered, for 15 minutes. Stir in fresh mint and cook, covered, for an additional 5 minutes. Process: Puree the soup to your desired consistency using an immersion blender or by transferring it to the bowl of a blender or food processor. I recommend pulsing it rather than pureeing, to retain some texture. If you want a thinner soup, add more broth. Stir 1-2 cups of yogurt into the soup, to taste. Correct the seasoning with salt and pepper. To Serve: Serve hot or chilled. Ladle into bowls and garnish each bowl with 2 tablespoons of yogurt and a sprig of mint, if you like.